Colt 1903 .32 ACP Triple K 16M 8 Round Magazine Hammerless 32 Automatic Pocket Model New Blue Steel Buy 3 Ships Free! Description: NO MAGAZINE SALES into NEW YORK CITY. CONNECTICUT residents must furnish us a copy of your CT Eligibility Permit or ammunition certificate. This listing is for ONE magazine; winning buyer, however, may take any number of extras we have available at the same per-mag price. Most of us who’ve been in the firearms business for any length of time came to know Triple K Manufacturing through their excellent leather gear. Triple K of San Diego has been in business since 1946. Of all the manufacturers, Triple K is the only source left for magazines to fit many discontinued firearms. Photos show specimens of the Triple K #16M, their blue steel magazine to fit the Colt Model 1903 Pocket Pistols chambered in .32 ACP or 7.65mm Browning Caliber, The 32 Automatic caliber. Construction is all steel body, springs, cartridge follower, and floorplate. This magazine holds 8 rounds of .32 ACP Ammunition. It will not accept .380 or any other caliber. 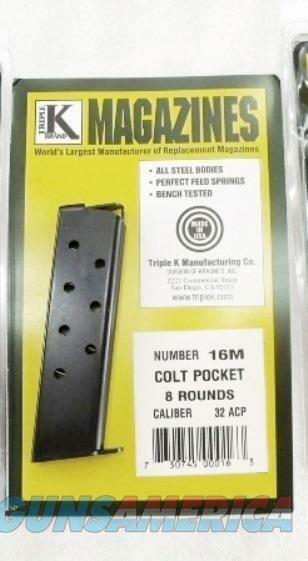 This magazine fits only the Colt 1903 Pocket pistols manufactured from about 1903 until around World War II. We’re offering these brand new Triple K magazines each	for only	$ 29.00.Not for sale to residents of New York City. Any magazine deliveries into New York City require written permission from the Police Commissioner, so we cannot ship magazines into New York City, per NYC Code 10-131.10. Connecticut buyers must furnish us a copy of your State Issued Eligibility Permit or Ammunition Certificate, per P.A. 13-220. Any ammunition, firearms, or personnel showing in any of our photos are NOT included. >>>>>>>>>>>>>>>>>>>>>>>>>>>>>>>>>>>>>>>>>>$3 Lower 48 First Class Mail Padded Envelope; $10 Priority to AK HI PR. First Class sometimes requires removing the item from its package.